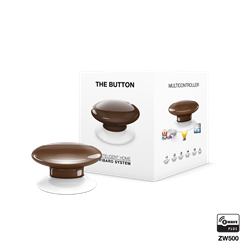 The Button from Fibaro is a multi purpose Zwave controller that allows you to control a single Zwave device or scene. The Button is battery powered and completely wireless so it can be installed anywhere. Place it under a desk as an emergency button. Place it on top of a desk or stand to control lights or trigger scenes. Place it on the wall as a quick access button for whatever you can dream of. When used with a compatible controller, The Button can not only recognize a regular press, but also 1, 2, 3, 4 or 5 clicks as well as 'hold down'. The Button is compatible with most major smart automation hubs including Home Center 2, Home Center Lite, SmartThings, Homeseer, Vera, Nexia, Clare Controls.